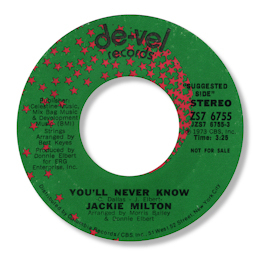 Jackie Milton only had a couple of 45s out, and the second one was a considerable improvement on the first. Her version of “Will You Still Love Me Tomorrow” has the sort of swaying slinkiness that the talented and interesting character Donnie Elbert brought to his wonderful cut of “Where Did Our Love Go”. This isn’t too surprising as Elbert owned at least a part of Buffalo, NY based De-Vel records. And of course it is his distinctive falsetto you can hear in the background on this track. You’ll Never Know has a lovely melody and a real toe tapping feel to the rhythm, especially thanks to the bass. Milton has a confident contralto voice with a lovely delay to her sense of timing. Another song that grips your brain like a vice. UPDATE ~ I'm delighted to say that Jackie Milton herself has been in touch. She writes "Where in the world did you find these old records,believe me I am honored.........Thank you so much!!!!" Isn't that kind of her? Thanks to Mike Finbow for spotting that Jackie is a woman!